My favorite gaming convention is Gary Con, founded in Gary Gygax’s home town of Lake Geneva, Wisconsin, in 2009, the year after he passed away. I attended many of the early Gary Cons, but regrettably have missed the last few years. I’d heard the convention had outgrown the local lodge and was now being held in a much larger venue a few minutes outside town, the Grand Geneva Resort & Spa, and I was very curious to see just how big it has become. So I packed up my car on Saturday morning and made the 90-minute drive north from St. Charles, Illinois, to Lake Geneva. How much has it grown? A lot. 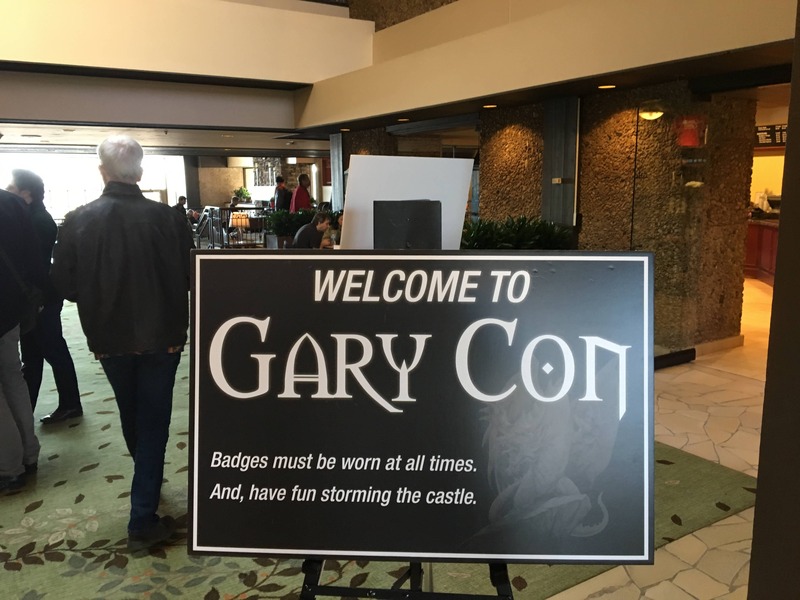 Just a few years ago Gary Con was a few hundred gamers who gathered to remember Gary and celebrate all that he brought to gaming. But on Saturday morning I walked into a sprawling modern gaming convention, with thousands of folks happily throwing down dice in multiple buildings and numerous gaming rooms. 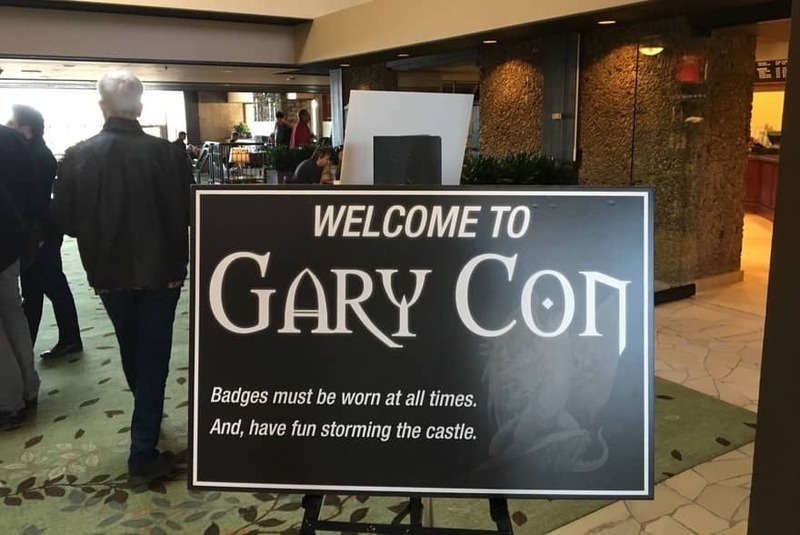 I’m delighted to report that, while it had gotten much grander, Gary Con has lost none of its friendly atmosphere — or its focus on the kind of old-school role playing pioneered by Gygax. The highlight of the con for me is always the Exhibit Hall, which has always felt more like an intimate gathering of friends than just a place to hawk wares. 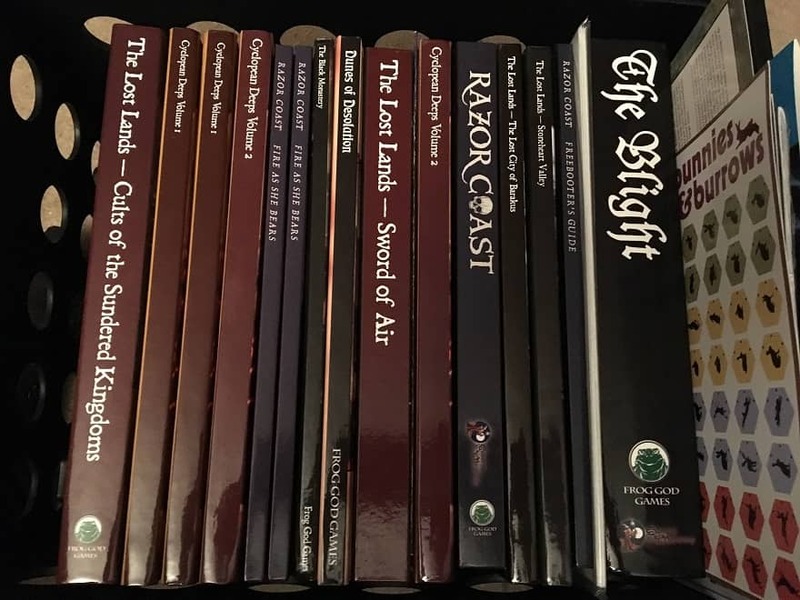 In past years I’ve met many some of the most creative minds in the OSR (“Old School Revival”) community there, including Jeffrey Talanian, author of the Astonishing Swordsmen & Sorcerers of Hyperborea RPG, Daniel Proctor, creator of Labyrinth Lord, Stephen Chenault, creator of Castle & Crusades, and Jon Hershberger, co-founder of Black Blade Publishing (OSRIC). Every year I also take the opportunity to meet up with friends such as Dave Kenzer and Jolly Blackburn of KenzerCo. The tiny Exhibit Hall has grown enormously since I’d last attended, however. 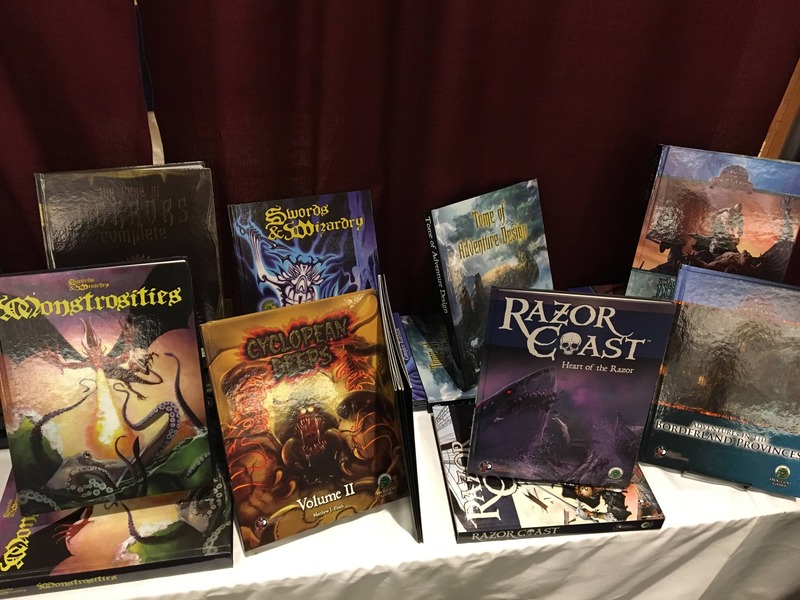 In fact, there were over 50 exhibitors spread across two halls, including Frog God Games, Goodman Games, Kobold Press, Northwind Adventures, Troll Lord Games, Hammered Game Tables, Inner City Games Designs, Pacesetter Games, Total Party Kill Games, and many more. Truly an old-school role player’s paradise! 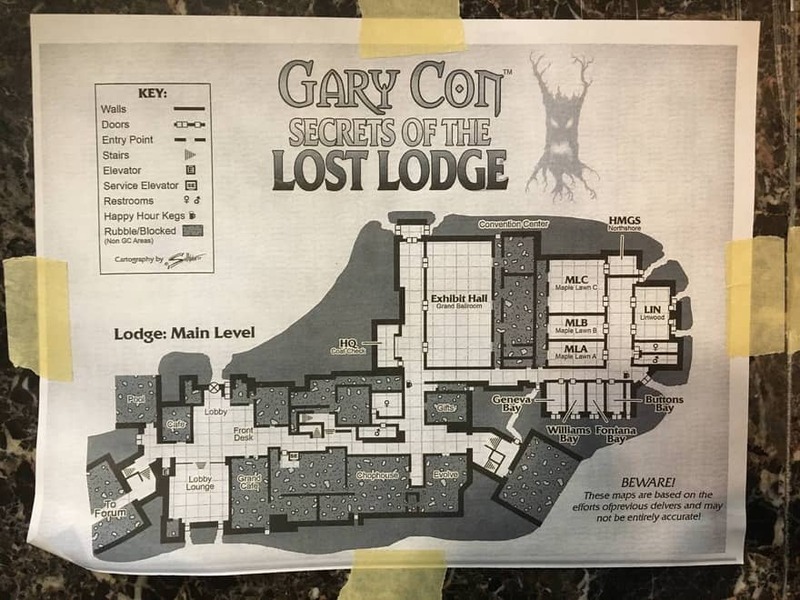 The first thing I noticed as I was picking up my badge — well, the second thing, after the huge Gary Con welcome board that read “Have Fun Storming the Castle” — was that the convention committee had re-designed the ubiquitous resort map for the Grand Geneva as an old-school dungeon map (for “Secrets of the Lost Lodge”), and pasted it around the con. Now that’s the kind of creativity and fun I remembered from truly old-school gaming conventions. Once I had my badge I headed right into the Exhibit Hall, which was packed with dozens of vendors selling marvelous wares, not to mention a few hundred gamers. The first thing to grab my eye — since it was prominently displayed in the biggest booth in the Hall, the Goodman Games/Black Blade Publishing space — was the very first issue of Tales From the Magician’s Skull, the long awaited new Sword & Sorcery magazine edited by Black Gate‘s own Howard Andrew Jones. The issue, which comes packed with stories by Black Gate favorites such as James Enge, John C. Hocking, Chris Willrich, and the illustrious Howard Andrew Jones himself, looks absolutely fantastic. Check out our recent interview with Howard, publisher Joseph Goodman, and the terrifying skull itself here. And pick up a copy before it sells out — at only $14.95, this guaranteed collector’s item won’t last long. 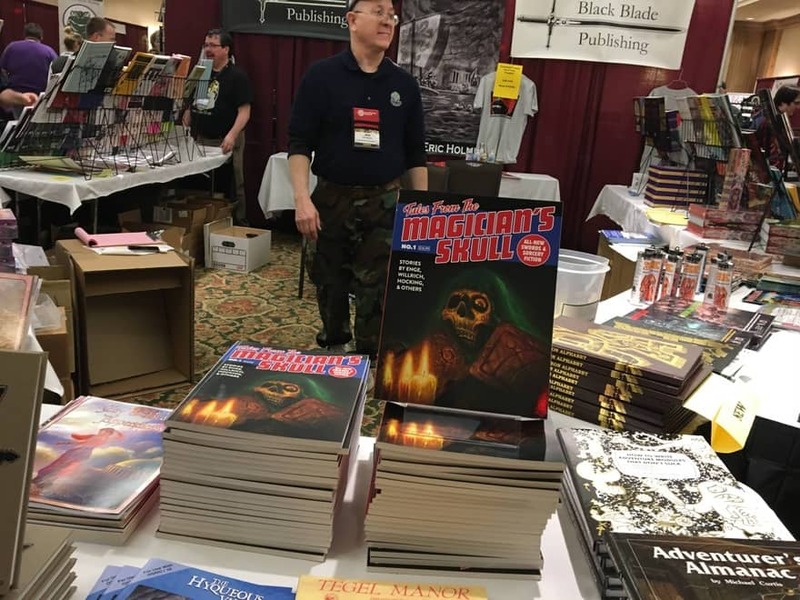 I didn’t have long to ogle Tales from the Magician’s Skull, as immediately to the left of Goodman Games was the North Wind Adventures booth, and the man himself — Jeffrey Talanian, co-author (with Gary Gygax) of Castle Zagyg, and creator of the fabulously imaginative Astonishing Swordsmen & Sorcerers of Hyperborea. I bought Jeff’s slender gaming adventure Charnel Crypt of the Sightless Serpent eight years ago at my very first Gary Con, and enthusiatically reviewed the complete version of the RPG when it was released two years later. Jeff and I have kept in touch ever since, and I was excited to finally have a chance to buy a copy of the second edition of Astonishing Swordsmen (which Bob Byrne covered for us a while back). Alas! It was not to be. Although he’d brought plenty of stock, Jeff was already sold out of the second edition. In fact, he told me he’d sold out by Friday! Jeff was kind enough to sell me a copy anyway, with an offer to mail it to me as soon as he got back to his office. We chatted for a while afterwards, and we reminisced about Gary Con II, when he was selling only a single slender adventure for five bucks. He now had a complete line of games, support material, and t-shirts — and a major RPG title. I asked how Gary Con was going, and he told me it was a terrific show for him. 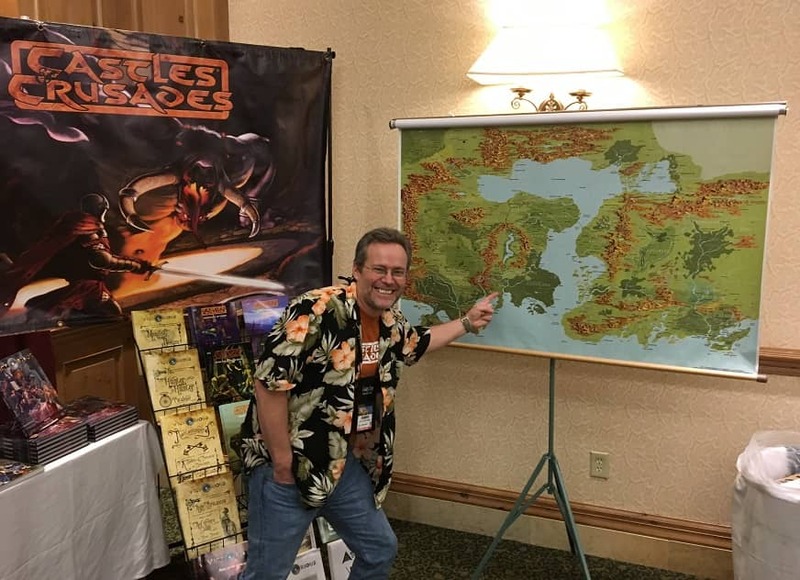 He no longer attends Gencon, as an exhibitor booth costs him around $6,000, and it’s very difficult to recoup that kind of investment when you only have a single game line. Shows like Gary Con are a much better investment for him. 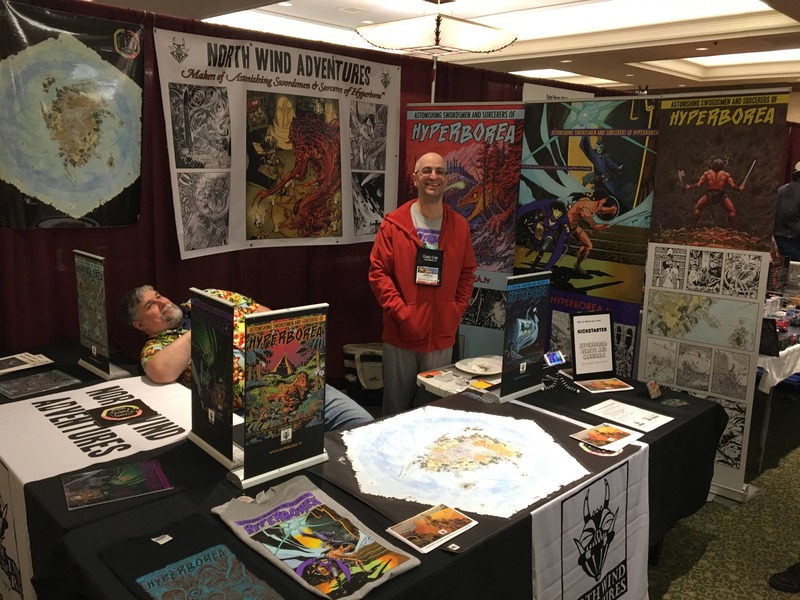 In fact, North Wind Adventures was doing fabulously — Jeff quit his job last year, and game publishing is now his full time job. Check out the Northwind Adventure Games website here. 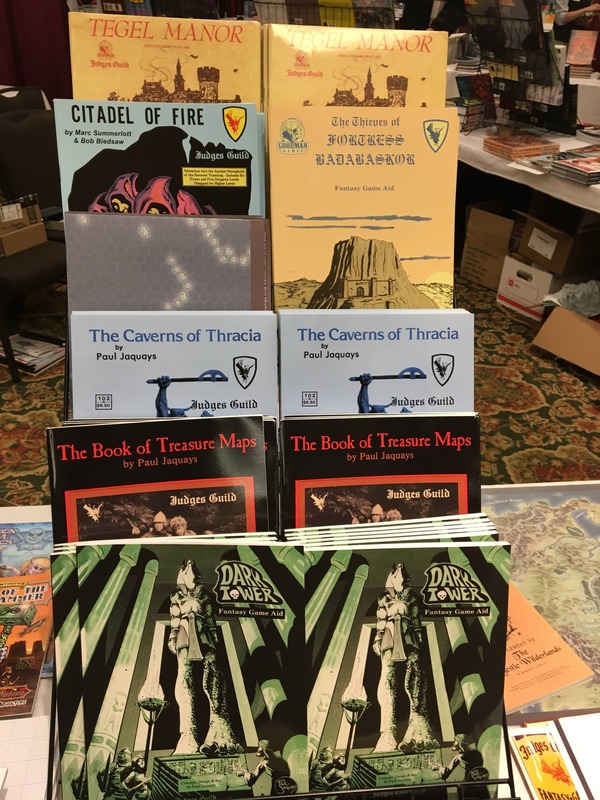 Back at the Goodman Games booth, I was immediately drawn to their new line of quality Judge’s Guild reprints, including Tegel Manor, Citadel of Fire, The Thieves of Fortress Badabaskor, and two of my all-time favorite adventure classics: Dark Tower, and Paul Jaquays’ The Caverns of Thracia. I would have snatched up copies of both of those last two immediately, but they were a little pricey for reprints: $29.99 each. That’s more than I paid on eBay for mint condition copies of the originals twelve years ago. Probably copies cost more than that now, and I expect I’ll shell out for the reprints eventually. The reproductions look very sharp, and they’re definitely on much better paper than the originals! 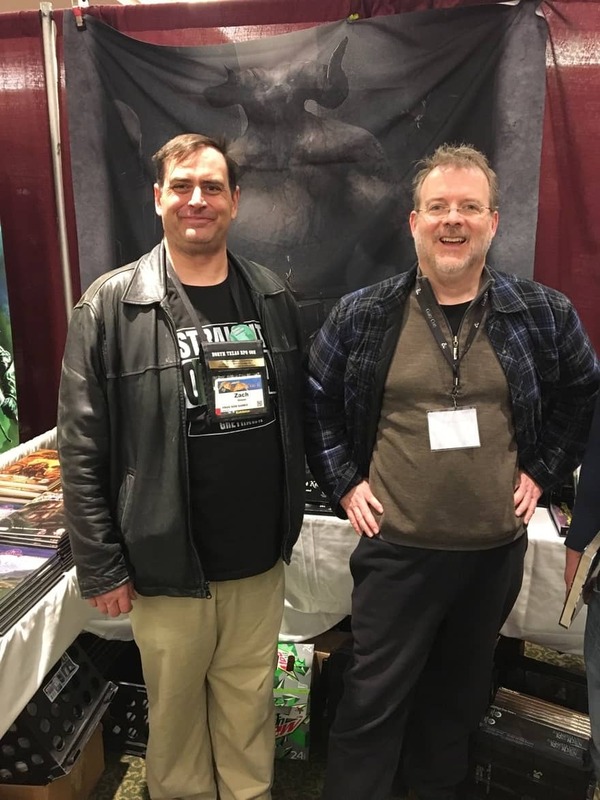 Next up was Stephen Chenault and the magnificently well-stocked Troll Lord booth, right across the aisle from Goodman Games. Stephen’s been very good to Black Gate readers and RPG gamers of all kinds over the years, as his company has produced some of the most acclaimed OSR products on the market, and continues to lead with a wide range of exciting new releases — including their brand new 5th Edition Roleplay and Amazing Adventures lines, which complement their long-running (and much-loved) Castles & Crusades titles. Stephen was as energetic and fascinating as always. He told me that Gary Con continues to be his best show, and he showed me their fantastic line of new releases. 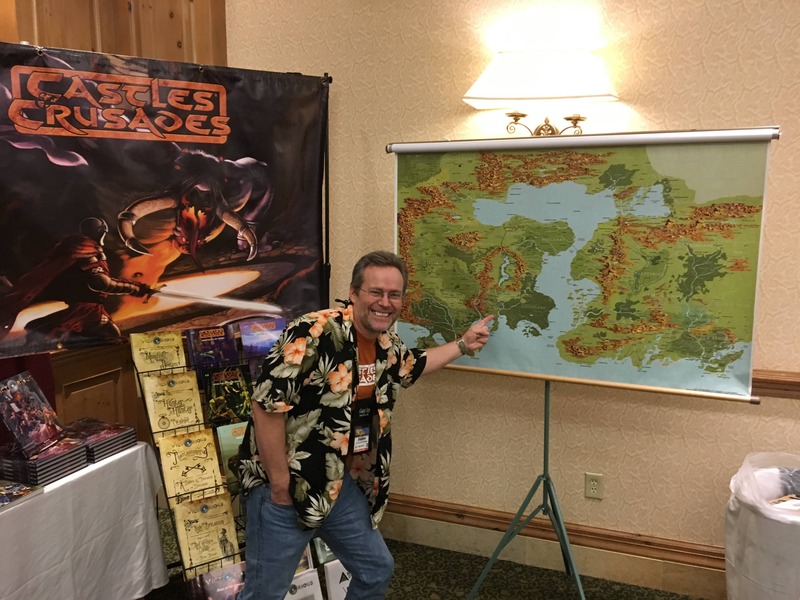 Curiously, Stephen noted that, while he sells some product on both the East and West coasts, he sells by far the most in what he calls the “Gaming Crescent” in the Midwest — from Kansas City up through Wisconsin, into Ohio and northern Indiana. Check out the Troll Lord Games website here. I could easily have spent my entire time at the show (and all my money) in the Blade Blade/Goodman and Troll Lord booths, but I had folks to meet. 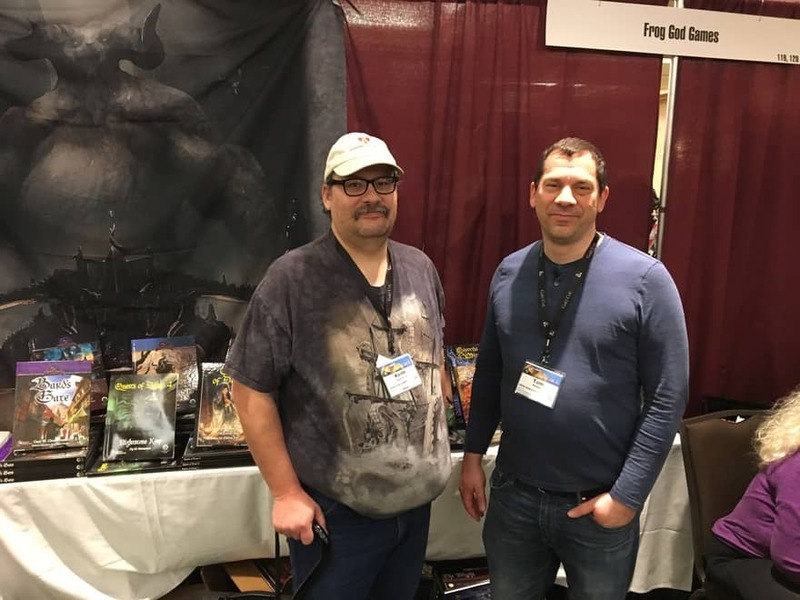 Our roving game reporter Bob Byrne had urged me to stop by the Frog God Games booth and introduce myself to the movers and shakers over there, and I was happy to comply. The first folks I met in the booth were authors Keith Hershey and Tom Knauss, who were very friendly and knew of Bob’s work at Black Gate. Tom was the author of their excellent environmental books, including Perilous Vistas and the upcoming Icebound. 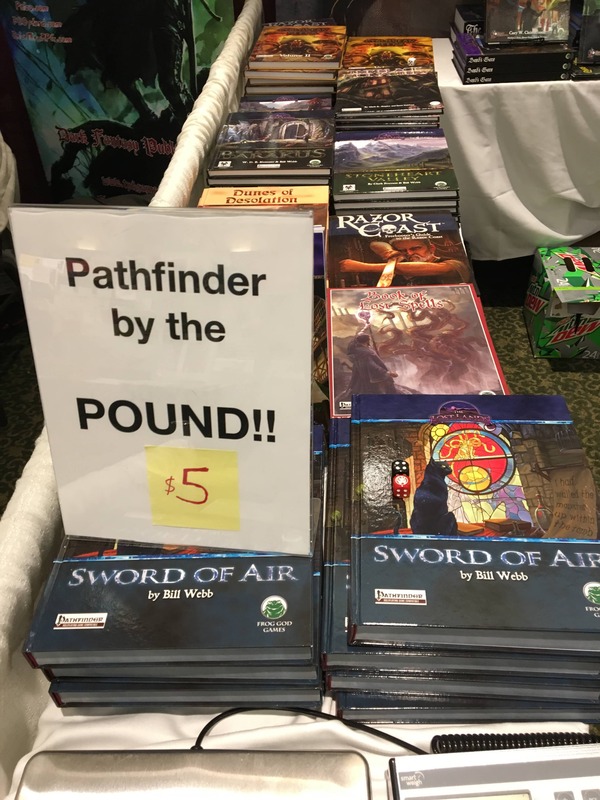 We quickly struck up a conversation around the big news of the show — Paizo’s announcement of a Second Edition of Pathfinder (which Bob covered here). Had the announcement taken them by surprise? In a word, yes. Tom said they were “blindsided” by it, and in fact they’d had to cancel an upcoming First Edition Pathfinder title. Did they think all the attention to the upcoming Second Edition would negatively impact sales of their extensive Pathfinder back catalog? That certainly made a statement. Where there are challenges, of course, there’s also opportunity. Frog God Games has a top-notch rep as a producer of Pathfinder support material… Couldn’t they be the first out of the gate with Second Edition title? Surely there would be plenty of demand. That was possible, they admitted, but the problem was they knew nothing about the new system — no one did. In fact, they claimed that two days ago Paizo had told them it wasn’t happening. During our conversation co-owner Zach Glazer arrived, and I was glad to be able to take a picture with him in the booth. My giddy joy at being surrounded by so much role playing coolness comes across pretty well in this pic, I think. Zach also gave me some cool Frog God swag, including an early preview of their upcoming Bunnies & Burrows RPG, a re-make of the 1976 classic from Fantasy Games Unlimited inspired by Watership Down. Visit the Frog Gods website here. My only regret was that, as I was driving back to St. Charles five hours later, I noticed I’d forgotten to return the crate Frog God had loaned me to lug all the stuff to my car! Ah well. I’ll bring it back to them next year. 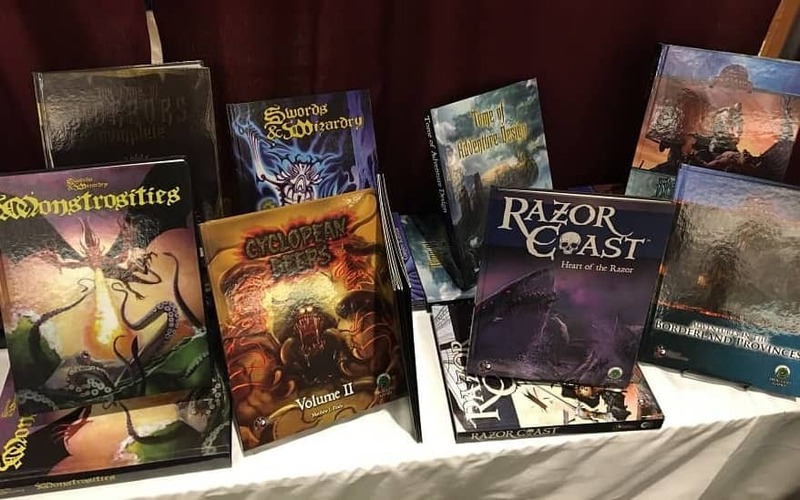 Part II of this report is a detailed walkthru of the Black Blade Publishing/Goodman Games booth, which was stacked high with treasures. In later installments of this report I’ll cover some of the other exhibitors — including Wolfgang Baur at Kobold Press, PJ & KC at Total Party Kill Games, the KenzerCo crew, and lots more — and pack in a lot more photos. Stay tuned. See all our recent Games coverage here. 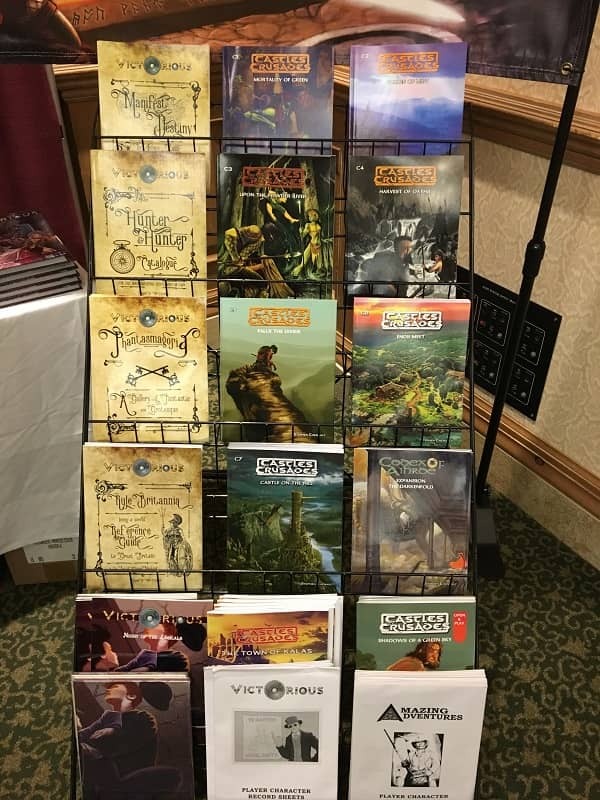 Use the coupon code GARYCON40. Great coverage, John! You make me regret I didn’t make it out there this year. You make it sound like you went shopping and then went home? Did you play any games? Thanks Gabe! And sadly, I had some pressing deadlines and didn’t have the luxury of signing up to game. Though to be honest, I’m just as content to wander around and talk to folks as I am to commit 2-3 hours to playing a game. There’s so much going on at Gary Con, and so much to see, that iI’m reluctant to make a big commitment. Years ago I was very interested in some of the old-school games they had on the schedule, but you had to sign up quickly to get a seat. I sorta wished I’d gotten a seat at the JOHN CARTER board game, and the CHAINMAL “Battle for the Moathouse”… but it was nearly as much fun just to watch. Man: I would have loved to have been there! Great coverage John! I’m going to ICFA in Orlando this week. I was hoping to give a report on that as well. I think I remember reading something similar in Michael Witwer’s biography of Gary Gygax, Empire of the Imagination. Witwer (if I’m remembering rightly) theorized that Gygax growing up and living in Wisconsin was a key factor in producing the RPG, the long, cold boring winters. If Gygax had lived in New York or L.A., we might not have RPGs! Thanks for the report! Wish I could have attended. I live in Wisconsin (although I’m from New Orleans originally) and Lake Geneva is about 3 hours away. Unfortunately, personal circumstances prevented me from going to Gary Con. Hopefully, next year. I also plan on going to Gamehole Con in Madison this Nov.
My copy of Tales From the Magicians Skull came in today. Great coverage, John. I am disappointed I had to cancel at the last minute or I would likely have gotten a chance to meet you at the Frog God booth (I am the 5E guy for Frog God). Maybe next year. We do have some exciting stuff on the docket for this year and next. > Man: I would have loved to have been there! I wish you’d been there as well. I’m certain you would have taken much better notes than me! Maybe at Wincy City, you can conduct all the interviews, and I’ll take all the pictures. > Great coverage John! I’m going to ICFA in Orlando this week. I was hoping to give a report on that as well. That sounds great! I’ve never been to ICFA, and I look forward to your report. > had lived in New York or L.A., we might not have RPGs! Maybe there’s something to that. Not just the long winters per se, but the communal infrastructure of lodges and the like that valued social gatherings in the winter. I noticed when I was growing up in Ottawa that the wargamming hobby seemed to be closely associated with (and share people with) some of the old-school midwestern social orders like the Elk lodges and the Shriners, etc. It gave them a place to gather and game. And of course, role playing grew directly out of wargamming, as any good history will tell you. >Hopefully, next year. I also plan on going to Gamehole Con in Madison this Nov. Wish we could have connected! Leave a comment here if you plan on attending next year (WordPress will tell me). And I’ve heard great things about Gamehole! Have you been there before? > My copy of Tales From the Magicians Skull came in today. What do you think of it?? > We do have some exciting stuff on the docket for this year and next. Ah! So sorry I missed you. But tell me more about what’s in the pipeline. Would you be open to giving us a sneak peek at Black Gate? I haven’t had time to read it yet. I read the intro and I’m going to read the Morlock story when I get a chance. A sneak peek can probably be arranged. I can say that we have City of Brass 5E and Tegel Manor 5E dropping later this year along with some new IP for the Frog God Lost Lands setting (I’ll have to run it by Bill & Zach before I divulge anything juicy). Sounds great! You say when, and we’ll make it happen!